We’ve all had that moment, putting on a jacket and finding a long-lost Hershey’s Kiss in the pocket, or finding a forgotten bar of baking chocolate in the back of the pantry. Such is the power of chocolate that many of us would throw caution to the wind and gobble it right up when there is a good chance of stomachache–or worse. So how do you know whether your newly unearthed chocolate is still good? Do yourself a favor and watch out for the following five signs to determine whether your chocolate’s spoiled or if it’s safe to eat. When you see a white or grayish film on the surface of your food, it normally means the product has gone bad, but it’s a different story with chocolate. When the cocoa butter fats in chocolate separate from the cocoa mass and rise to the surface, it results in something called “fat bloom.” While not the most attractive thing to see on your chocolate bar, fat bloom is usually safe to eat. Chocolate that has been exposed to humidity or moved quickly from cold to hot temperatures can cause the sugar to crystallize. The result is a grainy, unpleasant texture, and while it’s not harmful to consume, sugar bloom doesn’t make for a very pleasant eating experience. A sniff test is an easy way to tell if your chocolate will be tasty or off-putting. Chocolate absorbs odors like a sponge, especially when stored in a fridge full of savory foodstuffs. Chocolate is best stored tightly wrapped, in a cool (about 65 °F, unrefrigerated), dry environment away from strongly scented foods. Chocolate is best when eaten within a year of its production, but high quality chocolate can be consumed well past its sell-by date. Some chocolate improves like wine, with age. 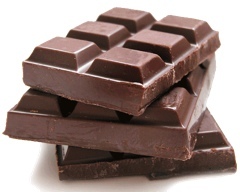 High quality chocolate contains natural preservatives called flavanols. Flavanols provide excellent antioxidant health benefits while keeping the chocolate fresher-tasting longer than store-bought chocolate containing artificial preservatives. A small nibble should be enough to alert you to any rancid or off tastes. Watch out for overpowering bitterness and the presence of other, non-chocolate flavors like onion or garlic. Cocoa powder can last a long time if stored properly in a sealed container, but can quickly take on a funky taste and scent if exposed to a pantry full of spices.